There’s a short list of bloggers I’ve met in person so far, Jen of Beantown Baker is on that list. I’d been reading her blog for quite a while before finally having the chance to meet her at TechMunch Boston, a year ago. It’s always great to put a face to the name, or in this case… the blog! Hi everyone! 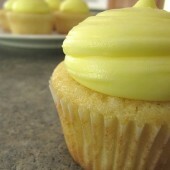 My name is Jen and I blog over at Beantown Baker. When Rachel emailed me about Apple A Day, I couldn’t wait to participate! 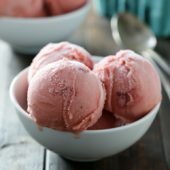 I’ve done themed weeks in the past and even attempted to only post pink foods last October, but I’ve never heard of a blogger posting 30 days of one type of recipe. Obviously, it’s a brilliant idea! I’ve enjoyed seeing all the apple posts going up every day. 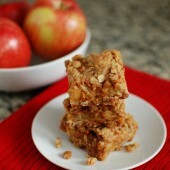 It has given me a lot of apple inspiration and I’ve definitely added to my must-bake list this month. While I eat apples all year long (one a day, in fact), like most fresh produce, nothing beats the taste of a freshly picked apple. Hubby and I make a point to go apple picking every fall. In fact, we’re headed out the the orchard later today for this year’s annual trip. 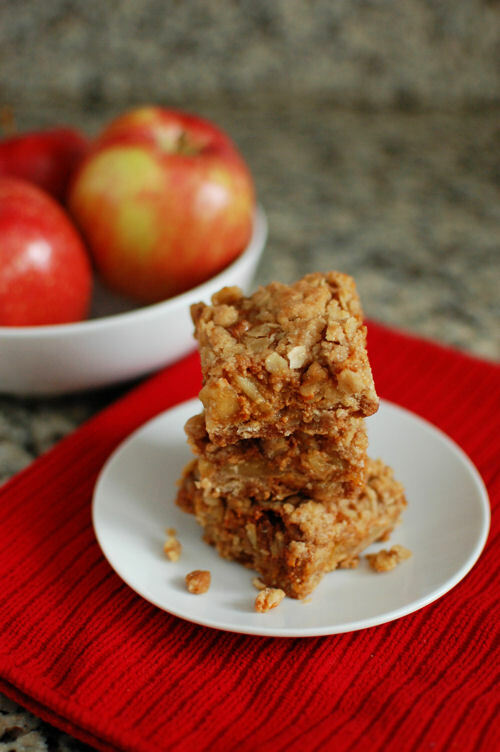 These bars combine some of my favorite fall ingredients – apples, oats, and cinnamon. Some dulce de leche is thrown into the mix as well. Because, well, why not. If you can’t find cinnamon chips, you can leave them out. 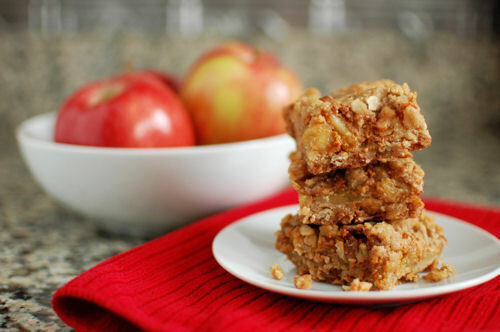 My coworkers called these apple cobbler bars, which is a very fitting name. I love that they’re portable and don’t require a fork and plate (isn’t that the best thing about bars?). If you’re looking for an easy yet impressive dessert to use up some of your apples this season, give these a shot. You won’t be disappointed. Cream butter and brown sugar until fluffy, about 3 minutes. In another bowl, combine 1 3/4 cup flour, oats, cinnamon, salt, and baking soda; stir into the creamed mixture until well blended. Set 2 cups of this mixture aside and press the remainder into a greased and/or lined 9×13 pan. Core, peel, and dice apples into thin, bite-sized pieces. Toss them with juice and 3 Tbsp flour. Spread the apples over the dough base. Sprinkle cinnamon chips on top of apples. Heat dulce de leche in microwave for 30 seconds. Repeat as needed until it becomes pourable, then drizzle it over the apples. Spread with a spatula if necessary. Sprinkle the reserved flour and oat mixture over the top and press down gently. Bake for 25-30 minutes, until set and golden. Remove from the oven and allow to cool. 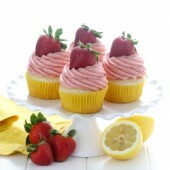 Cut into small bars and refrigerate until ready to serve or serve immediately while still warm. Store in an airtight container in the fridge for up to 3 days. You can find Jen on Facebook and Twitter. Check out more of Jen’s recipes: Blackberry cheesecake swirled brownies, Pumpkin cinnamon swirl bread and Banana Nutella muffins. These are fantastic! You can’t go wrong with dulce de leche! These sound delicious – and of course, I love that there are no nuts!! Oh my. 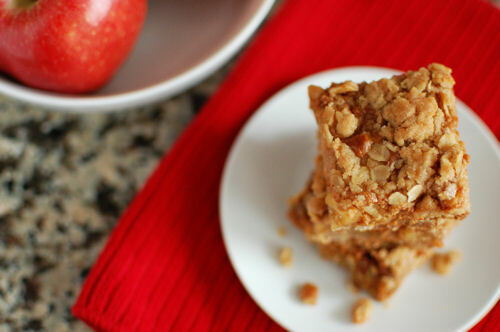 Anything with apples and caramel makes me crazy…adds a bit of crispy and well, I’m sold! I don’t see an oven temp. Am I missing it? I have these bars ready to go but don’t know what to preheat to! Whoops! So sorry about that. Somehow it didn’t make it over into the post. You should bake at 400 degrees. Thanks Rachel! I ended up making these on Sunday afternoon (I technically started them on Monday or Tuesday last week and kept getting distracted, so things were done in phases anyway). They turned out great! The cinnamon chips give them an almost butterscotch flavor that is savory but not overwhelming. And there is nothing better than a crumbly crust made of brown sugar and butter! This will definitely be a good recipe when I need to bake for a group, and I definitely recommend serving warm if you can. Thanks to you and Jen! made a small batch of these last night and they are fantastic!